The initiative has costed nothing but my time (though I have to admit that I’ve put in a lot of hours into this over the past few months). Finally this week I feel like it’s beginning to stand on its own feet. More and more people are remembering the event is on, actively seeking it out, and importantly are putting their hands up to be hosts. Being a member of the SEQICC, like other Chambers and business groups, is not about an organisation serving you. It’s not that kind of one-way relationship. Members are not customers, but rather partners. It’s about you as an individual member, thinking about what you bring to the organisation and what you need to do in order to get something of value from it. The membership fee will kick in again in a few months, and I’m guessing it will be a fairly nominal fee. I think it’s safe to say, that if members think that the SEQICC (completely run by volunteers who all give their own time) will be running around after people, they’ll be in for a rude shock. There are so many opportunities for individual Indigenous businesses to be promoting their businesses through organisations like the SEQICC, but it requires commitment and resources at their end to do it. Turning up, being involved, lending a hand are all part of the deal. I’m looking forward to seeing where this gig goes. I’m still excited about it. And I think others are slowly getting there too. 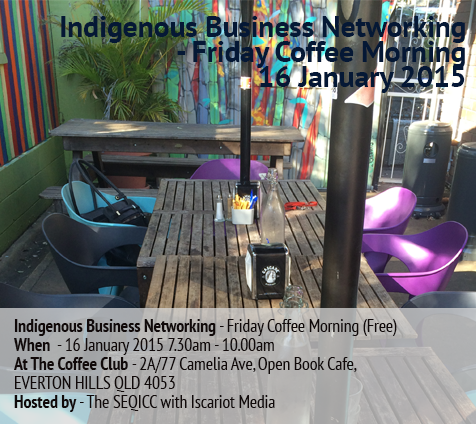 Image: Digital Flyer for the Indigenous Business Networking – Friday Coffee Morning (16 January 2015). Text over the top of an outdoor cafe scene of chairs, tables and umbrellas. Next Next post: What happens when the freelancer takes a sickie?